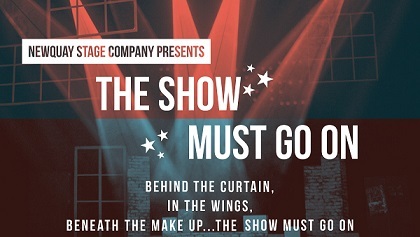 'The Show Must Go On' is a Juke Box Musical created with songs from musicals old and new, from West Side Story to Mean Girls! Come along and join us for our launch night at St Michael's Church Hall to find out what it's all about, meet the creative team and get your audition packs. Whether you're a singer, dancer or actor, want to be on stage a little or a lot, there is something for everyone! Actors wanted! We are currently looking for actors who wish to explore the art of improvisation and the devising process in performance. Interested? 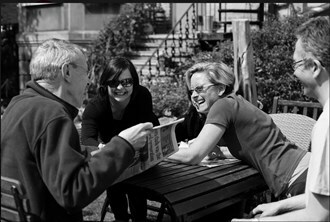 Come and take part in another of our one day workshops focussing on the principles of spontaneous theatre. Successful participants will be invited to perform with the company in a variety of Fringe Festivals in the Autumn season. We are holding open auditions soon for our autumn production of Jekyll and Hyde, which will be directed by Judith Hall and Megan Rogers. 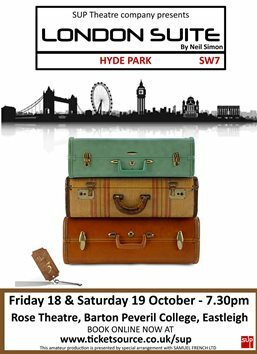 Auditions will take place on Sunday May 5th from 2.30pm - 4.30pm and Tuesday 7th May from 7.30pm at Blackfriars Theatre in Boston. 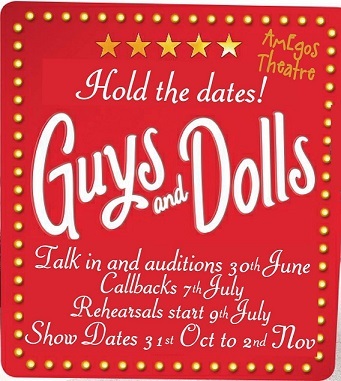 It is quite a large cast so lots of roles are available, both male and female. All are welcome regardless of whether you are currently a member or not. All welcome. Come and join us! 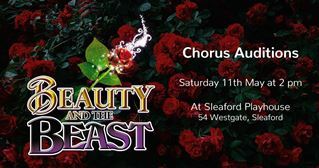 Panto is calling and we are looking for boys and girls aged between 10 and 18 years old to take part in this years show. 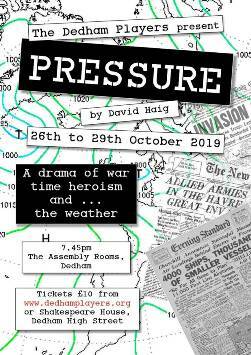 The Dedham Players announce open auditions for PRESSURE by David Haig. 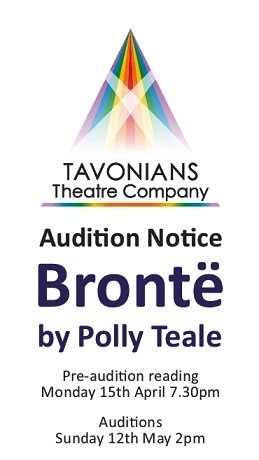 Auditions will be held at 8pm 13th May, 2019 at The Dedham Assembly Rooms, Dedham. PRESSURE takes place during the period of 2nd June 1944 to 6th June 1944 and tells the true story of the final preparations for D Day originally scheduled for 5th June. The play ‘thrillingly explores the responsibilities of leadership, the challenges of prophecy and the personal toll of taking a stand’. 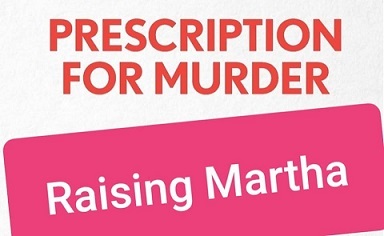 The Dedham Players were one of the first amatuer groups to be granted the rights to perform this play following the successful UK tour and West End run which ended in late 2018. 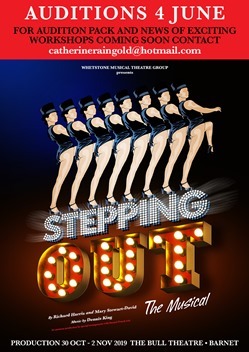 What better way to commemorate the 75th Anniversary of the D-Day Landings than by being a part of this show and bringing this momentous story to life on the Dedham stage? NB. The roles of Franklin/Spaatz; of Electrician/Ramsay; Battersby/Johns; may double up. This show is open to performers of all ages. PLEASE NOTE - For our popular pantomimes, priority is given to existing members, particularly the youngsters. 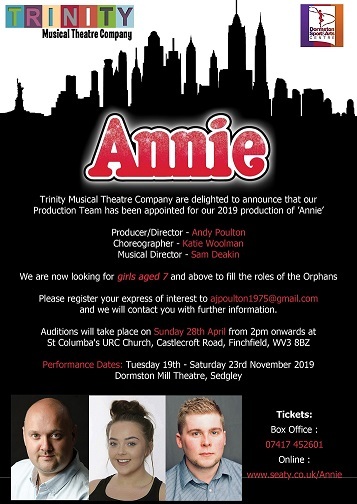 Auditions are on Sunday Sept 15th 2019 Please arrive to begin at 1pm. (doors open from 12). 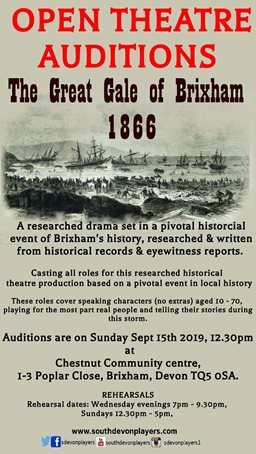 Casting all roles for this researched historical production. These roles cover speaking characters (no extras) aged 10 - 70, playing for the most part real people and telling their stories through this storm. People of all backgrounds very welcome. Rehearsals will be held at Chestnut Community Centre, 1-3 Poplar Close, Brixham, Devon, TQ5 0SA, the same as the auditions. For this reason, priority will be given to performers who live in the South Devon region. Please note that you will be expected to attend regular rehearsals.